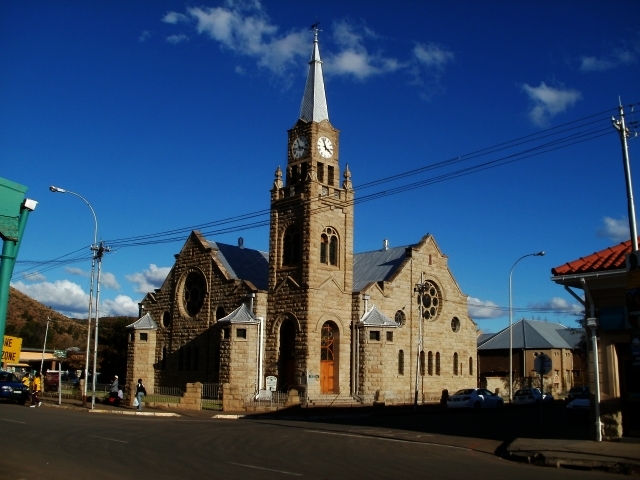 When we travelled down to the Western Cape at the end of April, we passed through the small town of Burgersdorp, and were impressed with it, as it seemed a very pleasant place. The houses were neat and well painted, and the streets were clean. Even the more workasday buildings at the industrial end of town looked clean and well-maintained. Since we had a long way to go, we didn’t stop, but on the way back we had the chance to spend a night there on 17 April, so we booked in at a bed and breakfast place called “The Nook”, run by Anita Joubert, and then went for a walk in the town. is shrouded in mystery, but here were the facts in a nutshell, which lay in Postma’s own history. 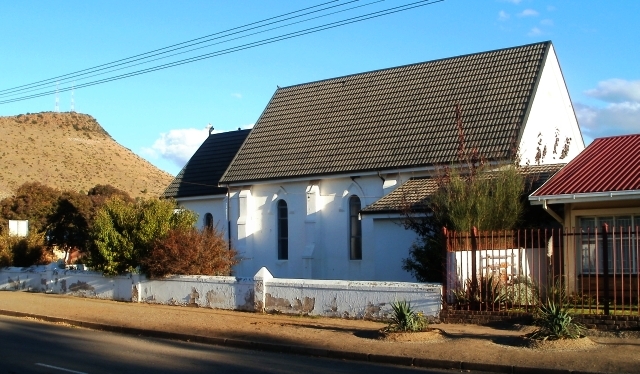 Dirk Postma was a minister in a strict Calvinist sect in the Netherlands, and when he came to South Africa disagreed with the Reformed Church in the Transvaal, and formed an independent congregation in Rustenburg, and then started a seminary of rthe Gereformeerde Kerk in Burgersdorp, where the denomination was nicknamed “Doppers”. We went on down the main street, and saw a sign pointing to a restaurant, but it seemed more like a cafe, and we bought cold drinks there. There were three Afrikaans teenagers at the counter, and one of them, a plump boy of about 13, was exceedingly polite, and greeted us with old-fashioned small-town friendliness. Around the corner was the Dopper Church. Around the next corner was the Nederduits Gereformeerde Kerk, which was architecturally far more interesting than the Dopper church, though less interesting historically. It had a kind of dome, and was built of stone instead of just being plastered. At the next corner was a bunch of ANC youth, singing songs, and as we turned the corner they had a kind of float pulled by a tractor, and were preparing for a procession to stir up interest in the local government elections the next day, and eventually the procession set off, about 20 cars and bakkies following the tractor up Kerk Street, and then back down the main drag, singing and waving flags and bouncing on the bakkies so that the springs were creaking, and a couple of them nearly fell off. They were a very jolly crowd. In the town square, among all the election posters, was one advertising the Dopper fete. The square was a sort of microcosm of South Africa. 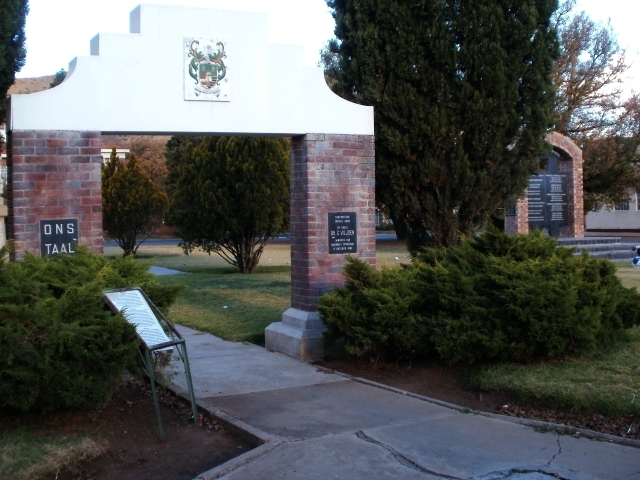 At the south side was a monument to struggle heroes, mainly young people who had been killed in the 1980s. 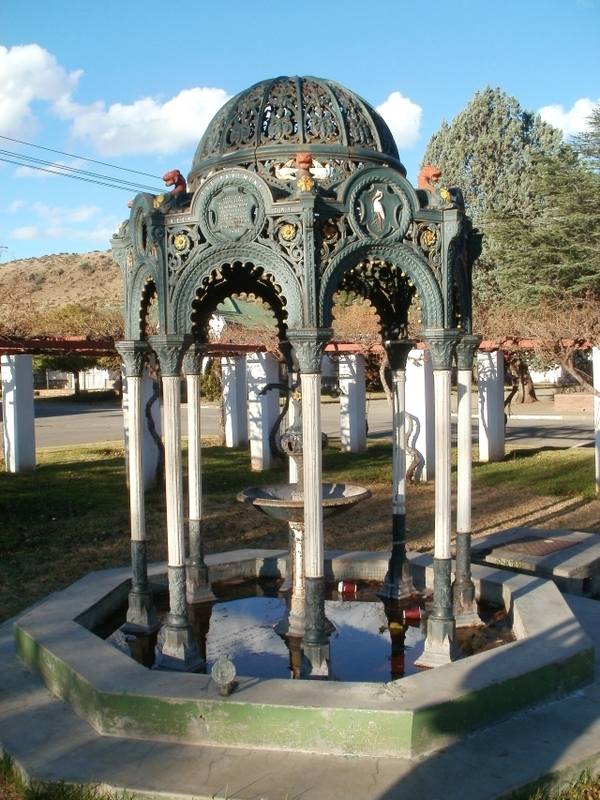 Nearby was an Afrikaans taal monument, with a statue that had originally been erected in 1881, and then defaced by “the enemies of the Afrikaner people” in the Anglo-Boer War, and unearthed from a grave in King William’s Town, and brought back to Burgersdorp, where it was re-erected with a replica of the original. And then, on the other side of the square was a structure that was probably intended to be a drinking fountain, erected by the citizens of the town on the occasion of Queen Victoria’s Diamond Jubilee in 1897. It was a cast-iron affair, and if it was ever a fountain, it wasn’t working now, though it was surrounded by a kind of moat in which a couple of paper cups were floating. Built into the fountain was the injunction to “Keep the pavement dry”, which made us wonder what it was supposed to mean. And so it was all there in one place, monuments reflecting the sentiments of three sections of the South African population who had fought each other bitterly in the past: British imperialism, Afrikaner nationalism and African nationalism. Now they are all there in the same grassy town square. The monuments represent the violent past, and there were the youth, representing the future. 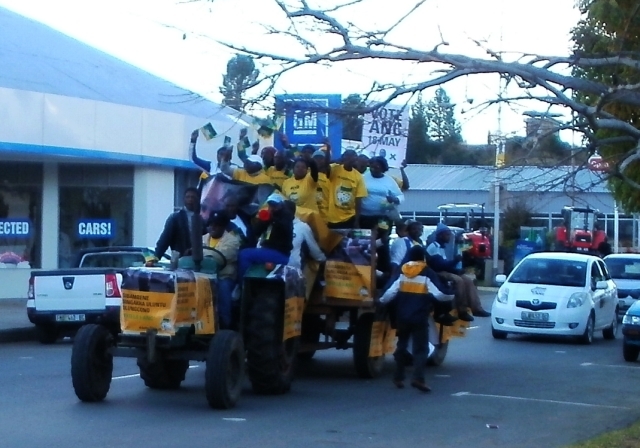 There are the quiet and polite Afrikaner youth, and the jollity and enthusiasm of the ANC youth promoting the elections. We wouldn’t be home in time to vote in the local government elections. It would be easy to get caught up in the enthusiasm of the youth, and to vote for the ANC, but then I think of Jacob Zuma, and the thought goes a little bit sour. Zuma may be a consummate political wheeler-dealer, but an inspiring leader he isn’t, not like Nelson Mandela, or even Thabo Mbeki. 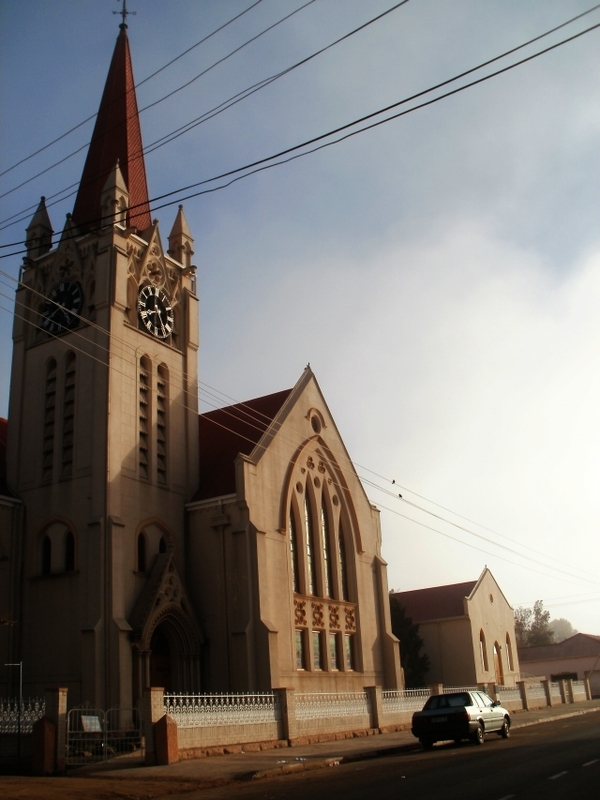 We walked back up Kerk Street, and passed another church, Christ Church, presumably Anglican, built in 1861, though the chancel was added later. It was whitewashed, and matched the older local houses, and it too, like many of the other buildings in the town, with the exception of the likes of the ubiquitous Pep Stores, was a historical monument. Burgersdorp is an amazing place. I like it. 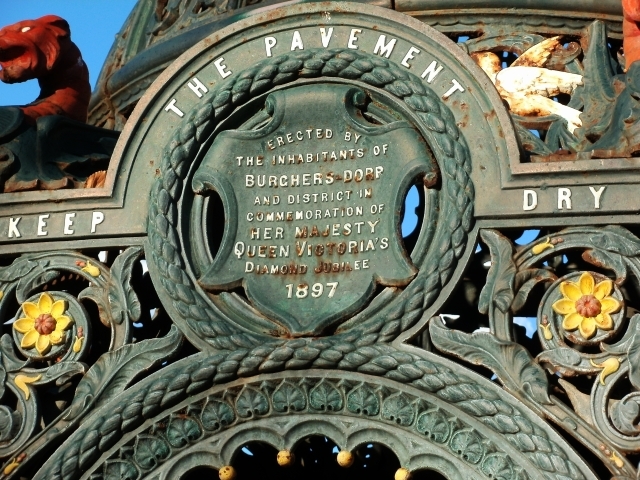 “keep the pavement dry” appears to have been a popular legend on drinking fountains around a century ago..
Nice pics. I missed them because I was specifically looking for the admonition “Keep the pavement dry” to see if I could discover why it was there. Someone pointed me to this which explains why the admonition is so common, but not why the manufacturers regarded it as “useful”. My hometown. 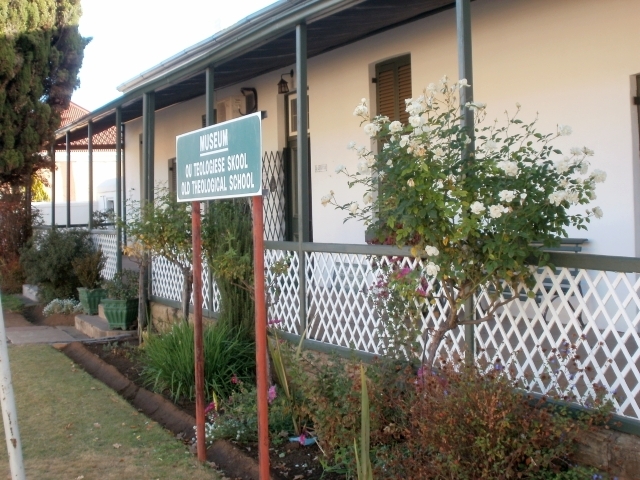 Finished matric there in 1986. The best place to grow up in. How is the house market in Burgersdorp? I grew up there in the late 60’s and 70’s. Very cold, but the people are warm. I would go back, but the cold is just too much! I go for reunions as often as I can. I went to the Gereformeerde Kerk and the first house in the article is a block from our house. Nostalgia!! Burgersdorp is the best town. I’m from Port Elizabeth but I went to school in Burgersdorp I couldn’t have asked for a better place, and today I’m very proud to say I’m a blikkie # Burgersdorp High School ” Slegs my beste”.